Q: Why doesn't the video have the same image quality as the source DVD? 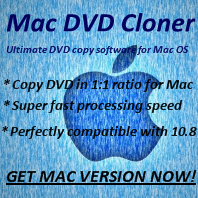 A: The program can be used to rip DVD to videos should be Any DVD Cloner Platinum. Please try to click "More Settings", change different option for "Video Codec" for a trial. Or try to rip DVD to a different video format like MKV. Besides, please make sure the original frame is not stretched via "More Settings"-->"Pictures"-->"Size".